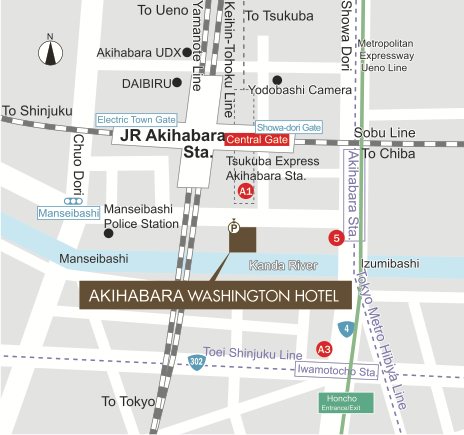 Akihabara Washington Hotel offers convenient access to the following major train and subway lines: the JR Yamanote Line; the Sobu Line; the Keihin Tohoku Line; the Tsukuba Express; the Tokyo Metro Hibiya Line; the Ginza Line; and the Shinjuku Line. Take the Keisei New Skyliner to Nippori Station. 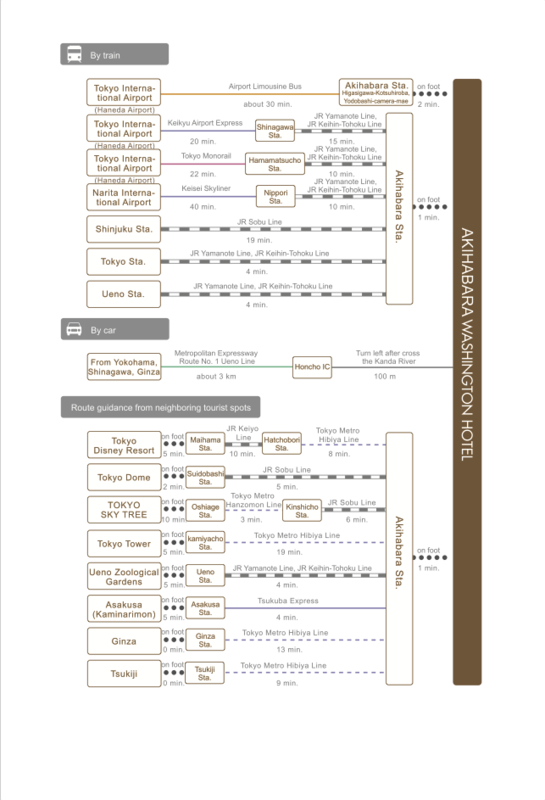 Transfer to the JR Yamanote Line and get off at JR Akihabara Station (approx. 55 minutes). Take the Tokyo Monorail to JR Hamamatsucho Station. Transfer to the JR Yamanote Line and get off at JR Akihabara Station (approx. 40 minutes). Take the Keikyu Line to Shinagawa Station. Transfer to the JR Yamanote Line and get off at JR Akihabara Station (approx. 40 minutes). Take the Limousine Bus to the east traffic square / Yodobashi Camera side of JR Akihabara Station (approx. 35- 40 minutes). Take the JR Yamanote or the Keihin Tohoku Line (approx. 5 minutes). Take the JR Sobu Line to JR Akihabara Station (approx. 20 minutes).